I brewed a lot of beer this week. Or at least saw a lot of it being brewed. About 900 barrels worth. Pam the Dirty Blonde. First batch of the week. Sunday, I worked at Beer at Home, and afterward I brewed Pam, the dirty blonde. Monday, I woke up at 5 am and arrived at Strange brewing at 6. Tim, one of the co-founders, agreed to let me watch him and help out. His partner was out of town, so I ended up getting to help quite a bit. The system at Strange is a Blichmann B3, with some big 50 gallon kettles. They have a few different sized fermenting tanks, the biggest of which is 3 barrels. The first batch we brewed was a pale ale for a pro-am competition. The am side of it was there to help out as well. 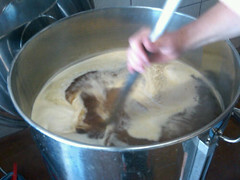 We also brewed the first of three batches for Strange’s Pale Ale. 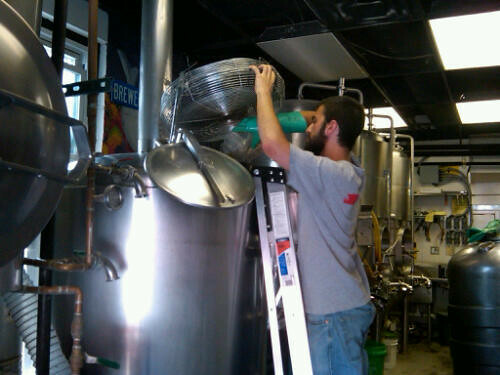 While things were heating, cooling, boiling, or mashing, we got some other tasks done as well. 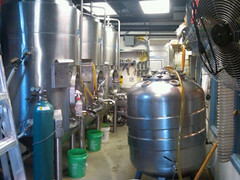 We cleaned some tanks, filled kegs, and generally cleaned things up. The day started at 6am, and I got home at 7pm. I didn’t have anything lined up for Tuesday, so I went back to Strange, and brought Kell with me. As we were just brewing, the day started a little later, at 7. We brewed 2 batches of the Pale Ale, cleaned some kegs, and worked on the glycol system. The day ended around 5. Strange was a great experience. In my post about size, I was considering the small 1/2 bbl system. We worked our asses off with Tim, mashing in, cleaning tanks and tuns, getting hops in on time, transferring beer, cooling things off, etc. It’s amazing what Tim and Strange Brewing are doing over there, and it helped me understand even more why I want Mad Haven to be at least 5-7 barrels, if not bigger. The experience was great, and I plan to help out Strange whenever I can. If you haven’t been over there yet, go check it out. Their tasting room is open 3:30ish to 8ish, Wednesday – Saturday. And they have growlers! 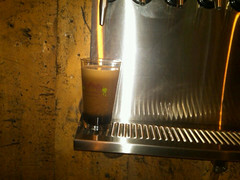 Check them out – 1330 Zuni, Unit M – strangebrewingco.com. Wednesday I woke up at an ungodly hour. I’ve seen 3:59 am many times, but very rarely at the start of my day. Missile Silo. 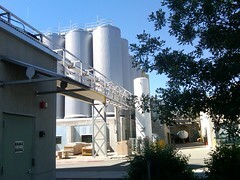 Wait... those are New Belgium's tanks. I drove to Fort Collins to visit New Belgium Brewing. You may have heard of them. By this point, my feet were killing me. I’ve been working a desk job for a few years now, so standing on concrete for a few days straight… ya, excuses. Anyway, I was excited for New Belgium, but my feet were not. Good thing their system is completely automated. 99% or so. It was quite the experience. I met Bo outside at 6am, and he gave me the best tour of New Belgium ever. Over the next 8 hours, I saw just about every valve in the place. And there are a lot of them. Bo said they have about 8 miles of stainless steel pipes there. 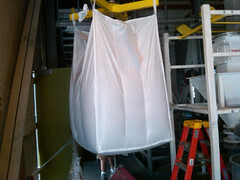 Super Sack of grains. About a ton. What an impressive place. The system itself was pretty much not applicable at all to my plans. I don’t know if Mad Haven will ever be in the same order of magnitude as New Belgium, at least in terms of scale. I don’t know if I want it to be. But it was cool to see. They have a computer system that manages every action in the brewing process. From blowing in the grain to cooling down the wort, there’s a screen and a button, and a brewer to push it. They were brewing about 900 barrels of Hoptober on Wednesday. I got there as the first batch was just about done, and left as the 8th batch was being blown in. Ridiculously efficient. 8 hours, and we touched 8 batches. Their equipment helps with this. They have a Merlin kettle. It has an upside cone shape at the bottom of the kettle. Wort is pushed in at the top, and it slides all around the cone. It is flash boiled there, coming to boil on contact. Imagine boiling a quart of water vs. just the water on the bottom of the pot. It’s like that. But hotter. It’s so hot and such a violent boil, they don’t even have to boil for an hour. The hops release their oil faster at those temperatures. I can’t get into everything I saw there. There was just so much going on. I got some great ideas for when we brew more than one batch in a row though. 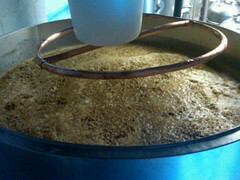 Like using leftover mash liquid to sparge the next batch. And some insight into hop utilization across batches. Very cool stuff. Bo was great. He’s got an impressive resume, including brewing school in England, brewing at Arcadia, and brewing at New Belgium for 7 years. He gave me some great advice for Mad Haven. He’ll be sitting at the bar when we open. One of the coolest parts of my day there didn’t exactly involve brewing. He might get in trouble for this, and if so, sorry Bo. But, we toured the entire place, and one stop was the barrel aging room. 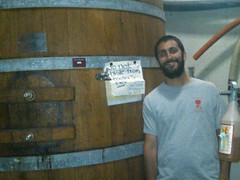 I may or may not have sipped some La Folie out of a massive barrel. Let’s go with “may not have” to protect the innocent. Other cool stuff happened. I met some great people, and saw some amazing things. Definitely a great experience. Thursday I went to Boulder to help out at Mountain Sun. Mountain Sun makes some of the best beer I’ve had, and their pub model is fantastic. I definitely spend too much cash (no credit cards accepted) at their pubs. Jason met me at 7 am, and we got to work. We brewed some Redemption Red, which everyone there was super excited about. They’re trying some new malts out, and it’s possible that the one I helped brew will get submitted to GABF. This was exactly the experience I was looking for this week. Mountain Sun brews on a 6 barrel “Frankenstein” of a system. It’s amazing. It’s barely changed in the past 20 years, because it works. Everything there just works. Jason put me to work. I got to pour in the grains and mix them into the water. If you’ve never done this before, imagine paddling a canoe through oatmeal. Hot oatmeal. I also got to clean out the mash tun, which is warm work. It was great, and I’m not being sarcastic. It really was an awesome opportunity. I helped Jason with the rest of the process too, from weighing out hops to cleaning the floors, from measuring gravity to some quality control. PS quality control is a necessary, important, and awesome activity. Mountain Sun was definitely the most applicable day. Brewing with Tim at Strange was great, as he does everything from run the books to clean the floors. But Mountain Sun brews on a system that I envision brewing on. It was great to work side by side Jason and really feel what my days are going to entail. It was sort of like Goldilocks. Not too big. Not too small. Just right. Overall, I learned a lot this week. From how to clamp a tri-clamp to how to stay safe, and many things in between. I made some friends and saw the extreme scales of brewing. And my fire for Mad Haven is reignited. I can’t wait to get it going. I have been getting a great response from brewers about shadowing this week. I even had to turn one down due to a scheduling conflict. It’s been amazing to see how supportive the local breweries are of a potential competitor! Side note, I don’t have a computer while between jobs, so this post is from my phone. And the weekend is in the air. I’ll report back on these awesome oportunities as the week goes on.